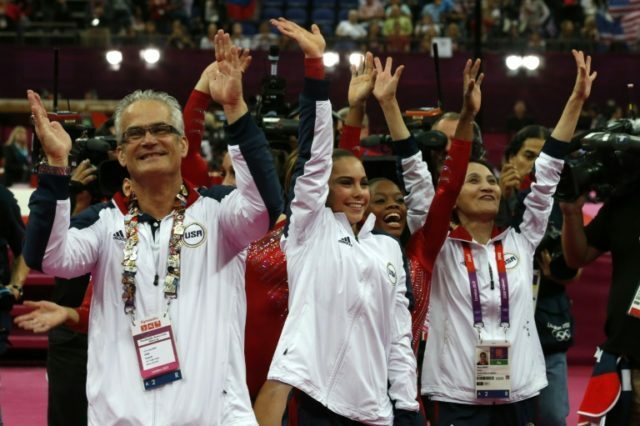 Chicago (AFP) – John Geddert, coach of the US women’s 2012 London Olympics gold medal team, has been suspended by USA Gymnastics pending completion of an investigation by the sport governing body, ESPN reported Monday. Geddert, 60, was the personal coach to US gymnast Jordyn Wieber, but has come under intense scrutiny because of close personal and professional relationships to Larry Nassar, the former US national team doctor convicted of sexual abuse of young gymnasts under the guise of medical treatment. “John Geddert has been suspended under the interim measures provisions of Section 10.5 of USA Gymnastics’ Bylaws. USA Gymnastics is unable to comment further as this is a pending matter,” ESPN reported the governing body as saying in a statement. The bylaw provision cited is one allowing USA Gymnastics to impose interim measures to ensure safety of gymnasts, although Geddert could request a review of the suspension. Wieber admitted Friday in a sentencing hearing for Nassar that she had been sexually abused by him, the first time she had publicly revealed the assault. Nassar, 54, pleaded guilty in November to 10 charges of criminal sexual conduct with victims as young as six and dozens of women and girls have spoken out against him at a sentencing hearing that will reach day six on Tuesday. Geddert operated two gyms that employed Nassar, ESPN reported. The 2012 US Olympic women’s team won gold with all-around champion Gabby Douglas and floor exercise champion Aly Raisman joined by Wieber, Kyla Ross and McKayla Maroney. USA Gymnastics required Maroney to sign a gag order not to talk about the abuse she received under terms of a $1.25 million settlement agreed in 2016, only waiving the order last week.